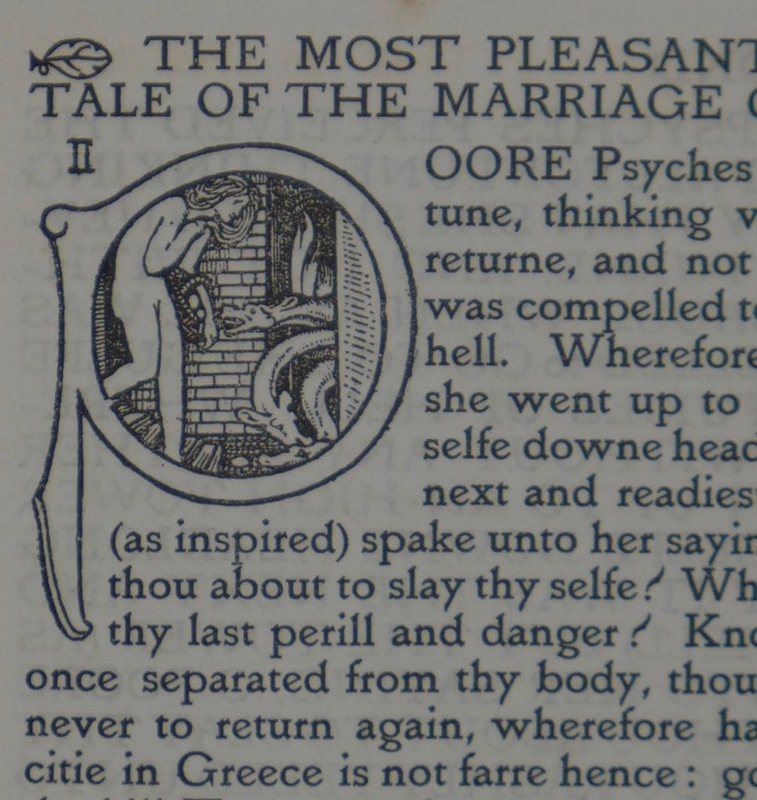 Poor Psyches perceived the end of all fortune, thinking verely that she should never returne, and without cause, when as she was compelled to go to the gulfe and furies of hell. The initial 'P' was designed for a specimen of the Vale Type that was included in the fourth number of The Dial in March 1896. 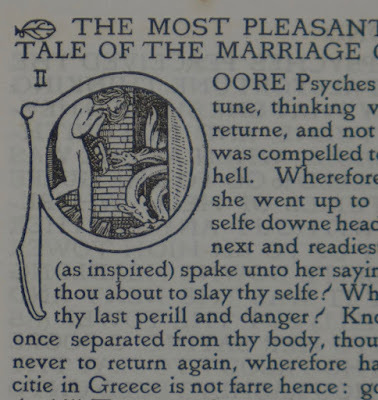 The image consists of three vertically arranged fields: (1) the halted and naked figure of Psyche, (2) a static brick wall, and (3) the moving, threatening dragon-like dog heads of Hades. The wall functions as a border between the two antagonists. They meet in the middle: the basket containing seductive barley cakes is close to one of the hound's heads that is attracted by its smell. 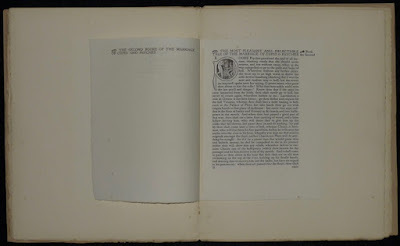 The folded specimen, printed on a sheet of Unbleached Arnold (Ruskin) paper, was pasted in the fourth issue of the magazine of the Vale Press group. A proof for the specimen is dated 18 December 1895. The initial was used twice, on page iii (text in lower case Vale Type) and iv (text in upper case Vale Type). 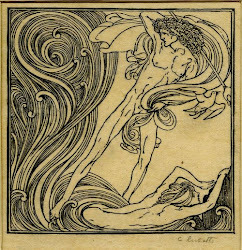 An image of the original drawing for the block had illustrated an article about Ricketts by his friend, the art critic Gleeson White. This was published in a new annual The Pageant. The first volume was dated '1896' and published in November 1895. The Dial appeared a few months later. The original image and the wood engraving are quite similar. 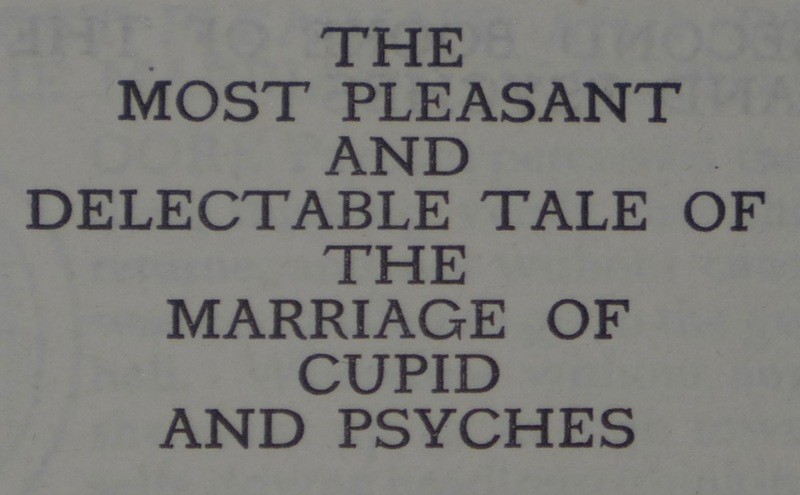 Finally, when The Vale Press published the edition of Cupid and Psyches in 1897, the initial was discarded except for the image. 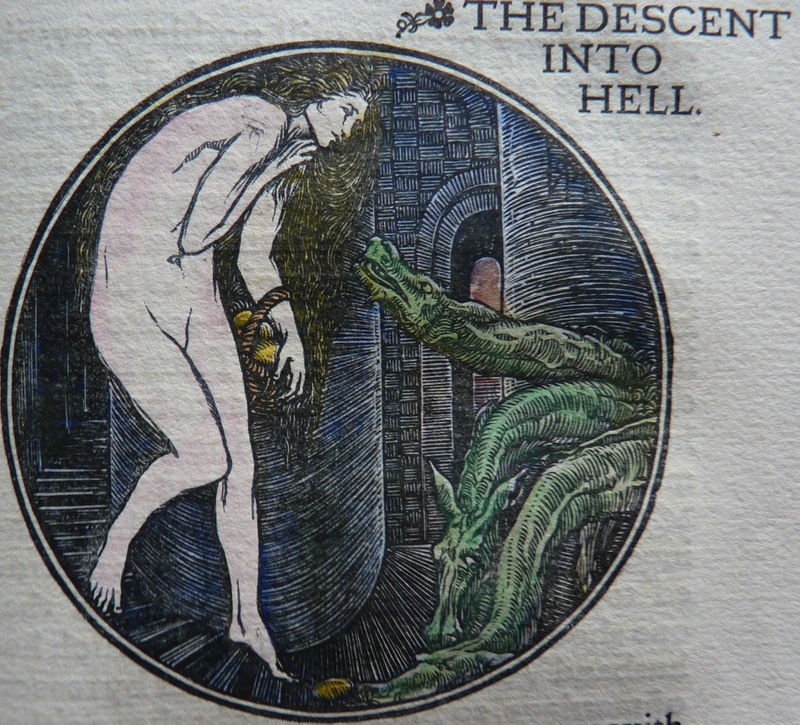 The roundel illustrations (that part of the design was preserved) in the book are larger (81 mm diameter as opposed to 31 mm), and the image of Psyche descending into Hell was thoroughly worked over and changed, as can be seen very clearly in an anonymously coloured copy of the book (for this image thanks are due to Vincent Barlow; see more pictures of this copy in blog no. 203). A stairway to the left has been added; there is another stairway leading to a stone gate in the background, and although the main figures of Psyche and the three-headed dog remained the same, this wood engraving involved a newly drawn design and a new wood block to be cut. 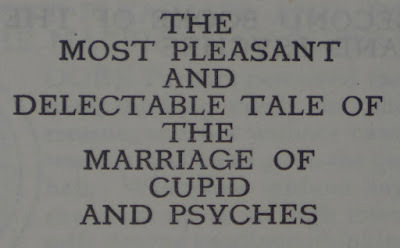 The text in the book edition was different as well. For the Vale Press edition William Adlington's translation of 1566 was chosen, while the words in the specimen were taken from an 1893 reprint based on the 1639 edition. The image was no longer used to illustrate an initial; it had evolved into an art work in its own right. The preparations for the descent into Hell are described on pages 51-52 - the roundel can be found on page 41. 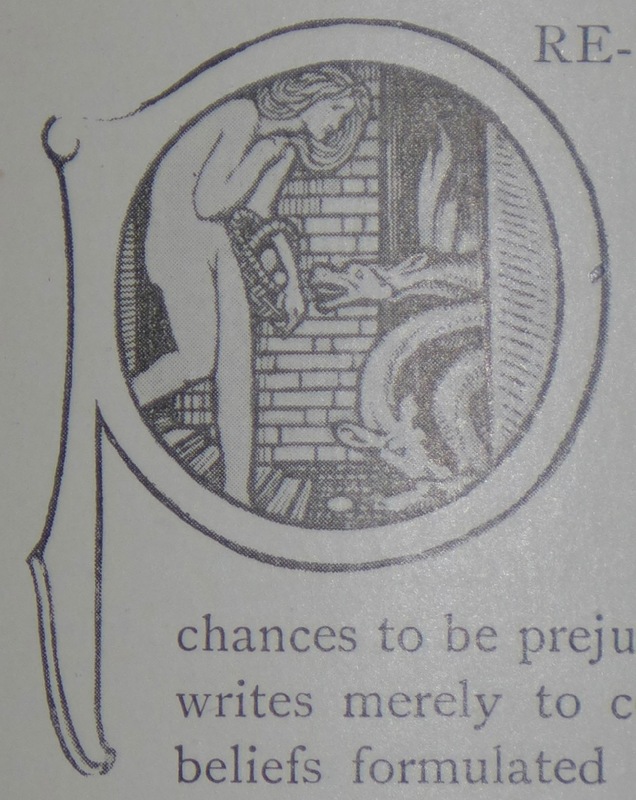 Between this particular paragraph in the text and the corresponding roundel illustration, one finds another roundel illustration depicting the final scene in the book ('Love's Pact with Jove'). All roundels are positioned on the first page of a gathering, which disturbs the relation between text and image. Ricketts didn't mind this at all. It helped to create an atmosphere of independence. 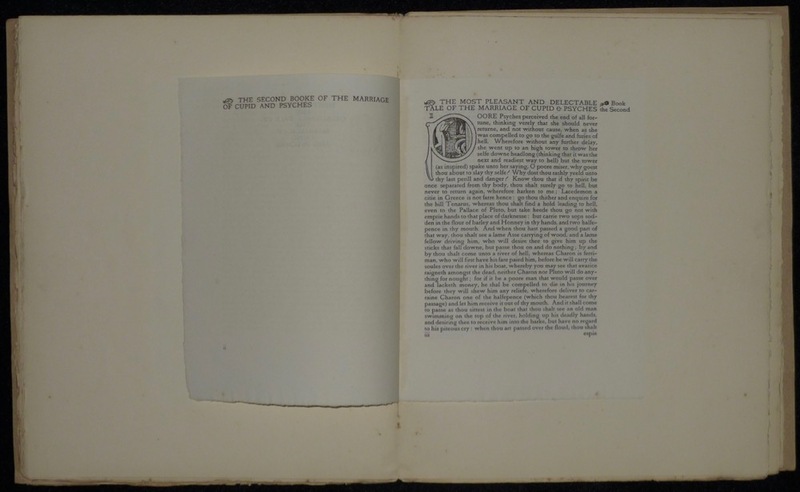 The wood engravings became autonomous works of art, based on Apuleius's original story, but showing a distinctly original interpretation, as Colin Franklin argued (in Golden Asses at the Private Presses, 1969).